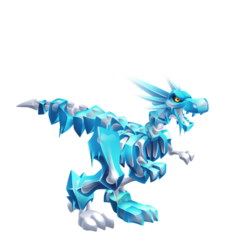 Thousands of years ago archaeologists froze the Verglas Dragon and transported it to a museum. Little did they know by freezing it they were restoring it to its natural element. It broke free and now roams freely around Dragon City. Find out how to breed Verglas dragon with the How to Breed Calculator! These dragons can all critical hit against Verglas, but won't be critical hit by Verglas.